Situé dans le centre de Vail Village avec tout ce que vous voulez ou devez à votre porte. Parking en surface ainsi qu'un parking souterrain chauffé. Fenêtres d'exposition du Sud face à la montagne et Gore Creek. Vous trouverez Condo est entièrement équipé pour rendre votre séjour parfait. Rien n'a été négligé ou laissé de côté. La Gondola Vail est à distance de marche et de l'arrêt de bus à Lionshead et Goldpeak mécaniques et des écoles de ski est adjacente à la stationnement de surface beaucoup. Si vous désirez aller à Beaver Creek à skier le centre de transport est également une très courte distance de marche de notre parking. Un foyer au bois ajoute au confort de votre séjour d'hiver. À la fin du printemps et en été la terrasse extérieure, située presque à Gore Creek, et les vues de la montagne en font un endroit idéal pour le déjeuner, le dîner, cocktails coucher du soleil, ou tout simplement se détendre. Ajouter tout cela au fait que même si l'appareil est situé dans le centre de Vail village son emplacement sur le ruisseau, avec des fenêtres donnant sur la Creek, permet un refuge très chaleureux, confortable, silencieux, privé. La taxe de vente pas requis pour les réservations de 30 nuits ou plus. The property is in a great location in beautiful Vail Village, has a wonderful view of Gore Creek and is just the right size for a couple and some overnight guests or visitors. On site laundry facilities make it easy when needed. Cozy, comfortable and just right! We stayed for 4 weeks over February and March 2018. Excellent location between the Village and Lions Head. Great view of part of the ski slopes and access to Gore Creek out the back. Just a couple minutes bus ride to Golden Peak, Gondola One or Lions Head. Plenty of restaurants to choose from within walking distance or a short bus ride. Parking is available above ground or in an underground lot. The condo has everything you need, 1 and 1/2 baths, great kitchen, living room and decent size bedroom. There is a wall of storage to unpack everything plus a Murphy Bed the grandkids used when they stayed over. This condo is at the top of our list to return to next year if it is available. 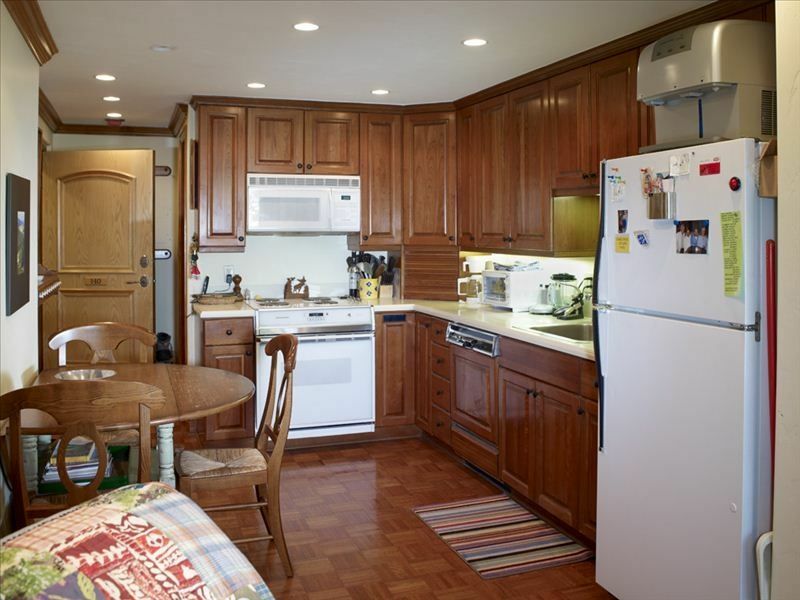 Right in Vail Village within walking distance of shops and restaurants. Bus stop close by to take you to Lionshead or Gold Peak areas. A quiet oasis in the middle of the action. Situated on Gore Creek facing south with a lovely patio area. We were a couple with occasional guests. The Murphy bed and 1/2 bath came in handy. The master with its own private bath was lovely with plush linens and towels. The owner was great and available by text whenever we had a question. We hope to get back there again next season. Hopefully your review, along with all our other positive reviews, help future guests to feel good about choosing our rental. Lorie & I look forward to having you as guests again in the near future. PERFECTION! NO SUPERLATIVES CAN DO THIS PROPERTY JUSTICE! Our rental from Christmas Eve to New Year's Eve 2017 exceeded our expectations. Photos and previous reviews did not prepare us for this gem in the middle of Vail - equidistant to Vail Village lifts and Lionshead lifts. In other words right in the middle of the action. The heated underground parking garage was an added bonus. The property itself, is beautifully decorated! Every convenience from spices and basic cooking ingredients (olive oil and vinegar) to zip-lock bags and dishwashing detergent were on hand. Thank you SO MUCH Bill and Lorie for enabling us to have such a wonderful vacation! This condo is the perfect location, in many ways...it's in the middle of Vail Village, it's on Gore Creek, it's close to Lionshead, near I-70 for convenience, nearby golf, tennis, pickleball, hiking, ski, arts, etc. etc. In addition to all this activity though, it's quiet and serene, so you decide if you want to veg or rock and roll. The condo has everything you need for your stay and is as comfortable as home. We enjoyed every minute of it! The property is beautiful, clean and up to date with all conveniences. We had a wonderful month in Vail. The condo was so comfortable and it's location on Gore Creek is spectacular. We won't hesitate to return sometime next summer.